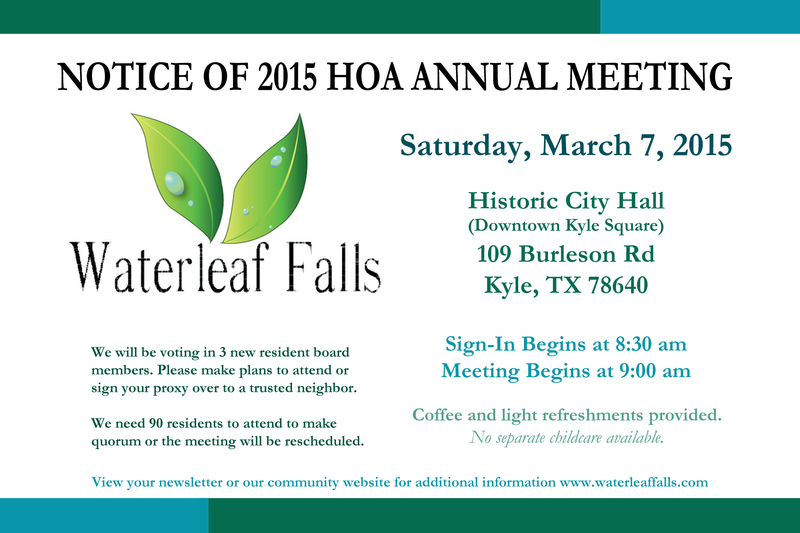 Our Annual Meeting is this Saturday, Sign in will begin at 8:30 AM and the meeting will start promptly at 9:00 AM. This meeting is your opportunity to learn about what your Board will be working on in the upcoming year, and to hear your valuable input. Also, this year we will be electing 3 residents to be on the Board of Directors. This means that starting this year the Board will be completely comprised of residents from our community! So come by and participate in helping make this community great! No separate childcare is available. ATTENDANCE – A quorum is required to conduct business at this meeting; therefore you are strongly encouraged to attend. We need at least 90 people present at the meeting in-person or via proxy. PROXY BALLOT – Meeting notices and proxy ballots have been mailed to all owners.In the event that you cannot attend the meeting, please fill out the proxy you received with your annual meeting notice to assign voting rights to a third party. You may also e-mail your proxy to a board member at waterleafboard@gmail.com or request that they pick up the form from you. It may also be returned to Goodwin Management by mail, fax or scan/email. **IMPORTANT** If you would like your proxy to count toward quorum, but do NOT want the person to vote on your behalf, please write “FOR ATTENDANCE/QUORUM USE ONLY” at the top of your proxy form. ELECTION OF BOARD MEMBERS – We will be electing 3 new resident board members at this meeting, which will give our residents complete control of community operations. We have been accepting nominations for representatives for some time and current bios for nominees are available for your review. Nominations for residential board members will also be accepted from the floor at the annual meeting.